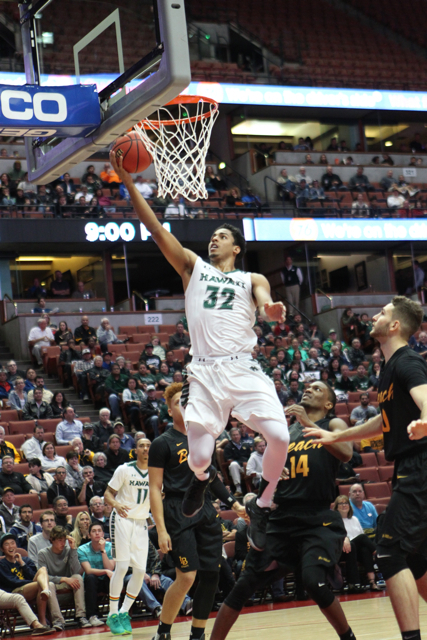 ANAHEIM, Calif. — The “next man up, every man up” mantra has worked wonders for the University of Hawai’i basketball team this season. Now the Warriors can focus on “next tournament up,” and for the first time in 14 years, it is the NCAA Tournament. 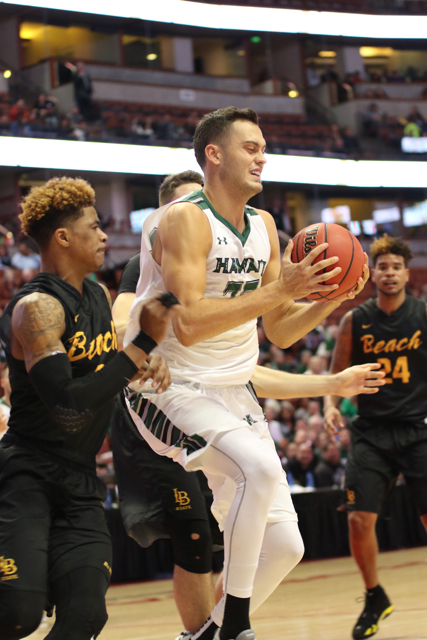 Hawai’i earned a bid to the Big Dance with an exhilarating 64-60 victory over Long Beach State in the championship game of the Big West Conference Tournament on Saturday. It is the fifth time in program history that the Warriors will be in the NCAA Tournament, and the first time since 2002. 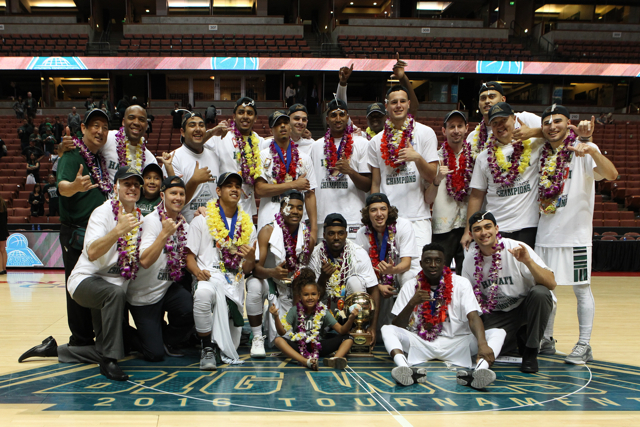 A crowd of 5,610 at the Honda Center watched the Warriors win their first Big West title (UH is in its fourth season in the conference), and dozens of the Hawai’i faithful stormed the court to celebrate with the team after the final horn sounded. Hawai’i, which improved to 27-5, tying the school-record for most wins in a season, will find out its opponent and regional site when the NCAA Tournament Selection Show is televised on CBS (coverage starts at 11:30 a.m., Hawai’i time. This championship came in dramatic style, as the Warriors received boosts from unlikely sources on a night when several of their key players were stuck on the bench with foul trouble. Aaron Valdes led the way with 14 points on 4-of-7 shooting, and he was named the tournament’s Most Valuable Player. Stefan Jankovic and Roderick Bobbitt – Hawai’i’s two first-team All-Big West Conference selections – were each limited to seven minutes of action in the first half due to foul trouble. They returned to their normal roles in the second half, and made significant contributions. 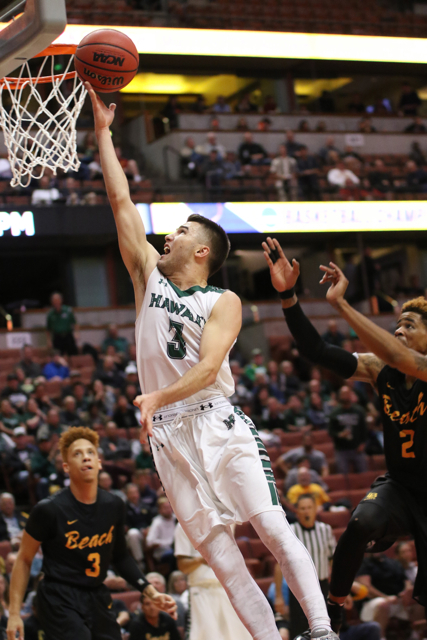 Jankovic scored all of his 10 points in the second half, including a 3-pointer with 2:45 remaining that broke a 58-58 tie and gave Hawai’i the lead for good at 61-58. He joined Valdes on the All-Tournament team. Bobbitt secured the victory by sinking two free throws with 1.7 seconds remaining. He finished with seven points and two assists. The Warriors also relied on their defense once again to pull them through. Hawai’i, which shot 45.7 percent from the field, limited Long Beach State to 37.3 percent field goal shooting, including just 22.7 percent (5 for 22) from 3-point range. The Warriors also out-rebounded the 49ers, 35-30, and went 17 for 24 on free throws to Long Beach State’s 11 for 12. Prior to Bobbitt’s final free throws, the Warriors had a 62-60 lead and came up with two defensive stops, as the 49ers had two chances to go ahead, but missed a 3-pointer on each possession. •	Junior forward Mike Thomas had nine points and six rebounds. •	Junior center Stefan Jovanovic also had nine points and six rebounds, and more than filled the gap when Jankovic was on the bench in foul trouble. •	Senior guard Quincy Smith, who was questionable to even play due to a hip injury, started the game and contributed five points, four assists and four rebounds. •	Freshman guard Sheriff Drammeh played 21 valuable relief minutes off the bench, and finished with six points (on two 3-pointers) and three rebounds. •	Sophomore guard Niko Filipovich was thrust into the spotlight after Bobbitt picked up his second foul, and he responded with four points – including a driving layup just before the halftime horn sounded to give the Warriors a 31-25 advantage at intermission. Hawai’i scored the first five points of the second half to increase its lead to 36-25, but the 49ers refused to fold and cut it to 38-32 with 16:11 remaining. The Warriors then scored six in a row, with the points again coming from unlikely sources – a layup and free throw by Jovanovic, and then a 3-pointer by Drammeh – to up the Hawai’i lead to 44-32. The 49ers staged a furious rally, cutting the Hawai’i lead to 51-49 with 7:37 remaining, setting up a dramatic ebb and flow of momentum swings between the teams down the stretch. A crucial swing came when Long Beach’s Nick Faust drained a 3-pointer to tie the score at 56 with 3:54 remaining. On Hawai’i’s ensuing possession, Faust was assessed his fifth foul while defending Jankovic, who would proceed to make both free throws to put Hawai’i ahead, 58-56. Long Beach tied the game again at 58, then Jankovic hit what would prove to be the go-ahead 3-pointer. Hawai’i had possession of the ball and a 62-60 lead in the final minute, but Bobbitt missed a reverse layup attempt, then was called for traveling while trying to chase down the loose ball. On Long Beach’s final possession, Justin Bibbins had an open look at a 3-pointer from the top of the key, but it bounced left off the rim and out of bounds to Hawai’i. With that, the Warriors exorcised two demons. One was the pain of losing in last season’s Big West Conference championship game to UC Irvine. The second was avenging two prior losses to the 49ers this season, including the season finale at Long Beach, Calif., where the Warriors had to watch the Long Beach student section storm the court after the game. Hawai’i still received the No. 1 seed for the Big West Conference Tournament, and proved its worth by beating No. 8 Cal State Fullerton, No. 4 UC Santa Barbara, and No. 3 Long Beach State in successive days. The 49ers, who dropped to 20-14, were led by Faust’s 17 points and eight rebounds. Bibbins added 12 points and eight assists, and Travis Hammonds, who also fouled out during the late crucial minutes, also scored 12. What a game!! Everyone asleep already, lol. Adrenaline still keeping me awake. It looked like both teams could not get into a rhythm and the refs were calling a lot of charging fouls which kind of interrupted the flow of the game. I was worried that we would be without Q but happy he started. It did looked like he was a step slow but who would have thought that both Janks and Rod would be sitting most of the first half and we would still have a lead. This team is special with that next man up mentality. What a play when the Long Beach player (forgot who it was) tried to throw the ball off of Thomas and it looked like it went between his legs. Then you got Rod stumbling and trying to call time out. Talk about stress but the team held up. I thought Faust looked great offensively but too many mental errors. I think Bryson is a better player. Anyway, just throwing out my thoughts on the game. Onward and upward. Go Bows. We Are Big West CHAMPIONS! BigFan — Agree — WHAT A DAY! Have YOU Ever Seen (and Heard) So Many Happy People? With Looks of Total Surprise And “Dis-Belief”! … playing Utah in Denver ? That would , normally, be a tough game because of the altitude. This team travels well however. Again, they’ve got to heal their bodies and prepare for the next game. AV deserved the MVP award because of his all around play. As he has done all season, he is all over the court, playing smart, and doing everything. I think whoever is giving out these awards is pretty sharp. AV and Quincy both are all over the court, and playing great defense. And Niko had another one of those ‘just grab the ball from the other player’ moments. Drammeh and MT are still taking charges, repeatedly. And Jovonovich is blocking and altering shots. This was a team win. Very fitting. Now they have got to double down, play one game at a time and just take on the next team that is presented to them. Go Bows ! There’s another game ahead ! Just win ! Go Bows ! Folks Of Warrior Insider IF you ever get a chance to experience this tournament it it is TRULY an amazing experience. The game will go down in Hawaii basketball history as an “all time classic” with BOTH teams just battling ! Among the 5,610 I was 609 with a GREAT seat right behind the bench and the atmosphere was just ELECTRIC the entire evening. From the battle of bands and cheerleaders the ENERGY all night inside the Honda Civic was thrills and chills every scoring and lost possession for both teams ! Janovich, Drammeh and Filipovich were just CLUTCH as they played quality minutes through out the contest and came up HUGE for the Bows! LBSU kept fighting as their will to keep coming back had all of us at the edge of our seats and when Nick Faust FOULED out all UH fans breathe a side of relief emphatically HAPPY to see him gone as this cat is a BALLER who you will see on an NBA roster! When the last seconds ticked off and Hawaii has secured this well deserved WIN, UH fans just STORMED the court as you could not see any players as they were engulfed with hugs and jubilation! The BEST $200.00 I ever spent in my LIFE for both women’s and mens tickets, parking, program and treating a Hawaii fan and former student to lunch at Schmids who traveled miles to come and see me! What a GAME, What a night for Hawaii ! Discipline + synergy => winner TEAM . COY / #1 staff are robust every game. 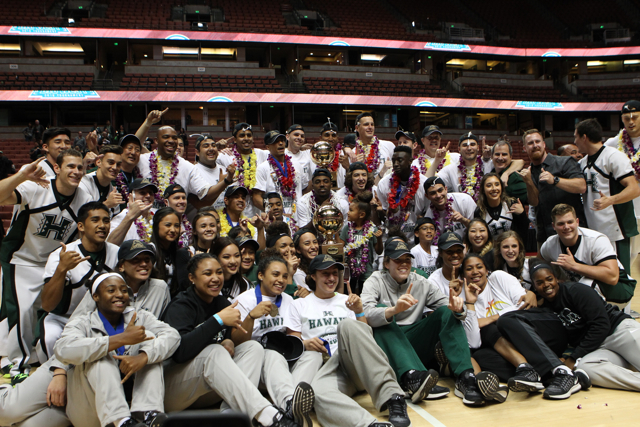 Wahine lead Warriors to Dance. Eagle: Your comments on Faust right on. Finally it was his turn to be exposed! We got to him mentally from the beginning. He never stopped crying. He still kept making shots, to his credit, but we wen OUST FAUST in the end and I loved every second of it!! Perhaps it wasn’t on purpose but simply due to Bobbitt and Janks foul trouble, but holding them out and keeping Sheriff and Flip in for so long really turned out to be genius by Ganot. I felt the refs turned in our favor with those two out. I swear, the refs do not like those guys. Maybe it’s cause they talk to them and question everything, but they get the WORST, most RIDICULOUS calls against them and then you can see us start to lose it. Wow, when those guys came out and I saw who we had on the court, I have to admit, my heart sank. I thought, OMG, what is going on? And then they did what this TEAM does. They stepped up. As Ganot said. Next man up. The calls stopped going against us, we played steady ball, we were under control, we maintained the lead and then some! It was THE MOST IMPORTANT stretch of the game in my book. Also, nobody was pouting on the bench, the starters remained fully engaged and supportive. This is CRITICAL! Aaron and Ashleigh. Neither made Big West First Team…both made Big West Tournament MVP. They would make great future UH BB kids, don’t you think? LOL!!! Match making mama. Getting ready to board my flight home. I have more to say…bummed that I’ll bring air during announcement of where we’ll play. So happy for these young men and women and thankful for all they have given to us, the fans. Mahalo. Unforgettable experience of a lifetime to be there on the court. All the naysayers and doubters of this coaching staff can be out to rest. They coached their butts off and the players came And conquered. Our guys made this the best time of all the tournaments or football games attended on the mainland. Never thought I’d be on the court celebrating and the Himda Center staff allowed us on the court. I hope the Matlin can start planning ahead to offer fans tournament travel packages for the basketball fans going to the tournament every year. Awesome day to be a Warriior basketball fan. Go Bows ! Onward to the dance. ! In the past weeks, when Ganot would play Sheriff and Filipovich he kept saying that they needed time on the court, they needed the playing time, and they needed the experience… Now, it paid off. Incredible foresight. And did you notice, a good omen. 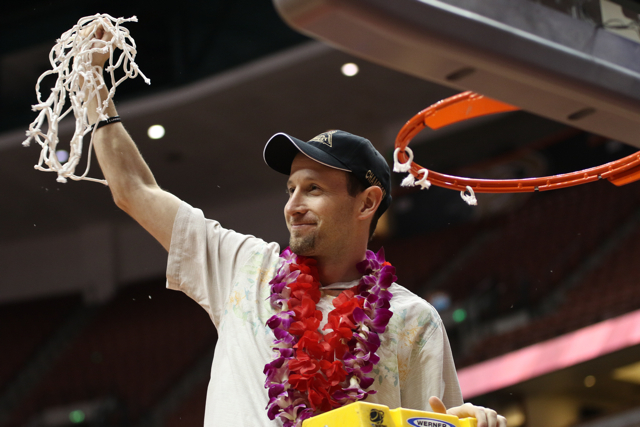 Coach Ganot and the entire coaching staff wore Aloha shirts. Hehe! How’s this for looking ahead. The NCAA says UH appeal is justified and postseason ban for next year is lifted. Jankovic, Valdes, and Thomas return for their senior season. Drammeh and Filipovich move into starting roles at shooting guard and point guard respectively. Jovanovic is the 6th man. Purchase, Owies, and Buggs move into the rotation. Niko gets a scholarship. Ganot looks for a 6’5″ to 6’7 SF to provide versatility, plus another player who might be a Division I transfer, ala like Tummala. Sounds like a contender again next year. Here’s hoping. Having played Oklahoma and Texas Tech tough I see no reason why UH can’t compete very well, and win in the NCAA tournament. We also beat N. Iowa who won the MVC who beat Wichita St. twice, and UH has shown we can win on the road. It comes down to the same things over and over again and that is rebounding, defense, shoot well enough, and stay out of foul trouble. Ganot has the formula. Just do it. When we’re 27-5 it’s a sign of respect. And N. Iowa beat N. Carolina. So, UH should have some confidence going in. In the Hawaiian vernacular, “we get chance”. If the shots from Blackwell and then later from Bibbins went in, it would have been a different story. But they were rushed by the good defense and were not fouled too. Valdes got the timely rebound after Blackwell’s miss. Then Thomas had the right stance to make the ball go through his legs on the out of bounds retrieval by LBSU. Earlier, at the end of the first half, NIko in the video took it to the basket on the left side by his high school teammate Bibbins and then Faust. Stef made a good jump shot earlier in a sequence with Quincy. LBSU has been to the NCAA’s 9 times, but three appearances were vacated by the NCAA during Tark’s time there. Also on the tv news last night, Janks said something like we did it for Hawaii, we love Hawaii. Njacinto, no doubt Ganot knows his players and put them in critical situations which they rise to the moment! Filipovich at one stretch in the game guarded Bibbins all over the court with his speed and defense that where I was seating across UH bench, Hawaii fans just ERUPTED with loud applauds cheering feverishly! Those GUYS entering the game and playing in that tough situation holds so TRUE to their mantra the entire season. Next Man Up ! islandman: As the resident researcher of this blog, I have a question: Are there any other schools that have both their men’s and women’s teams in the NCAA tournament that earned their berths by winning conference tournaments? I suspect there aren’t too many. Took a few minutes and answered my own question: Hawaii among eight schools that swept conference tournament championships. That’s in a field of 31 tournaments. Still, not a bad accomplishment. OK, it’s Cal in Spokane on Friday. Beat ’em in basketball, then beat ’em in football. Nice research. I’m surprised there are that many schools that swept their tournaments for both genders but still a nice accomplishment. BTW: Some respect, Hawaii got a 13th seed (most “experts” figured 14th). I feel confident about our chances of beating Cal if everyone healthy, focused, and composed. We also have the advantage of being overlooked. There’s talk already of Cal playing Maryland in the next round. Also, they’ve played teams we’ve played in recent past and had similar results: Colorado, Oregon State, and UCSB. Regarding Barkley’s quote, yikes!! Most talented is not always the best team so let’s see what UH can do with more experience. Interesting match up for Janks against Rabb if Janks doesn’t pick up some silly fouls. As someone else pointed out, Niko is a scholarship player. Also, sanctions lifted or not, aaron and janks are gone. (Timing of appeal is too late, decisions will have been made already, regardless of the outcome…but even without sanctions, these two are gone. They are old student athletes (both did a year of prep school after High school and both have red shirted a year). They both would be 23 before senior season. They feel they need to start earning and progressing their respective games beyond college. Can you blame them? This is the sport that will put food in their families’ mouths in the future. I wish them well, as they have given their hearts and souls to this program AND MOST IMPORTANTLY, please enjoy the ride THIS SEASON!! I keep seeing others talk of next season….enjoy THIS season!! I, for one, am loving the ride, living in the oresent, and embracing these guys!! Go bows!! Just win!! See you all in spokane!! !